The African Bullfrog (Pyxiecephalus adspersus) is one of the largest frogs in Africa. Adult males may reach 9 inches or more (23 cm). Females are much smaller. In nearly all species of frogs, the female is larger than the male. 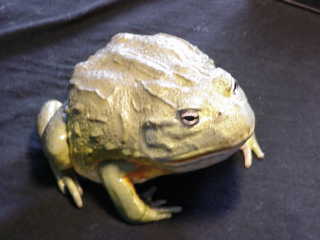 It is a stout frog with a large head. Mouth is large. The inner toes of the hind legs have a callus that is sharp and tough, it is used for digging. There is little webbing on the feet. The coloration of the African Bullfrog is olive-green with darker skin ridges. The voice is loud, like a deep bellows. It is highly aggressive and can inflict a serious bite. Local people consider this frog to be a delicacy. This species is native to tropical and southern Africa. They live in a variety of arid and semiarid habitats, such as savanna, steppes, brushland, and semideserts. African bullfrogs spend most of their life underground during the dry season. They go into a long "sleep" to avoid the harsh summer conditions common in sub-Saharan Africa. When heavy rains come, the frogs congregate in shallow pools of water to spawn. These frogs are easy to care for. Because of the aggressive nature of this particular species, it is mandatory that they be kept as individuals in a simple and relatively small terrarium. These frogs are mostly inactive, spending much of their time squatting in a corner. You should use a substrate of synthetic foam, layers of leaves, or moss. A large water bowl is also required so the frog can bathe, defecate and slough (the process of shedding a layer of skin). The terrarium should be kept at a temperature of 75 (F) or 24 (C), although lower temperatures will be tolerated without adverse effects. A daily misting of the frog will be much appreciated. In the wild, these frogs live in very dry conditions (scientists call it "xerophytic conditions"). During the long, dry summers, these frogs will burrow deep into the soil and cloak themselves in a watertight skin cocoon (made up of dead skin layers). This cocoon will prevent the body fluids from evaporating. The frog will go into hibernation. Feeding these frogs can be quite tricky. Despite the large size of these frogs, they can jump farther than you think. In an effort to grasp the food item, the frog may accidentally bite your hand. Forceps should be used during feeding. These frogs eat just about anything they can get into their mouths: chunks of lean red meat, whole fish, mice, and large insects, worms and other invertebrates. They are cannibalistic and should be housed in isolation except during breeding. Do not overfeed these frogs. Obesity is a serious threat to the frog's health. Male bullfrogs have a bright yellow throat and the throat of the female is cream color. It is not unusual for an African bullfrog to live 35 years or more. The photo above is a picture of my African bullfrog named "Spot." He is at least 10 years old and measures nearly 9 inches from head to vent. I keep "Spot" in a 15-gallon terrarium with a reptile bark substrate. There is no heater as the terrarium is kept at room temperature all year around. A low wattage fluorescent bulb provides lighting. He is fed one adult mouse twice a month, supplemented occasionally by read meat and fish. During the winter, he will often burrow into the substrate and disappear for a couple of months. When I dig him out of the substrate, you can see that he is wrapped in a cocoon and looks as shriveled as a prune. When I place him in shallow water, he expands like a balloon and I better have plenty of food ready -- he is HUNGRY! In order to keep a clean terrarium; a separate plastic container is used for bathing and feeding. He is bathed and misted every day. I always use conditioned water and regularly clean all containers with a diluted bleach solution. After a while, the frog will recognize you. One behavior I noticed is that "Spot" enjoys being misted and loves when I gently pull off the dead skin during sloughing. "Spot" protects my apartment when I am not home (a real "watch-frog") and is a good conversation starter when I have friends over.